Analysts have become increasingly pessimistic on Apple as the company's stock has fallen since the launch of the iPhone 5 last September. 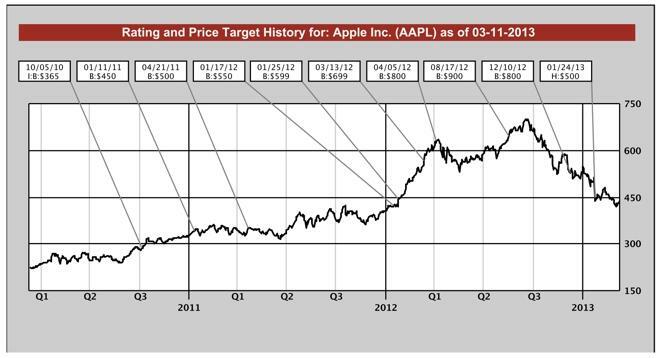 Among those bears is Peter Misek of Jefferies, whose new price target is below what AAPL stock is currently trading at. Misek came under fire last month when he cited "channel checks" that allegedly indicated Apple was planning a product event in March related to the Apple TV set-top box. But reliable Apple commentator Jim Dalrymple of The Loop quickly refuted those claims and said Apple would not be holding such an event. In his latest note to investors, Misek said his checks with Apple suppliers have indicated that Apple is reportedly having problems with new casing colors. He said that Apple had hoped to launch its so-called "iPhone 5S" in June, but now the device will debut between July and September. Misek also claims that some of the components for Apple's rumored low-end iPhone are higher than he expected, including a 4-inch Retina display and the same application processor as the iPhone 5S. As such , he expects the pricing of the handset will be between $350 and $450. The analyst has cut his iPhone estimate for the current quarter from 37.5 million to 35 million. He sees the company reporting revenues of $41 billion, but gives 25 percent "probability" that Apple will miss its guidance due to sales slowing even further in the second half of March. Analysts and investors largely viewed Apple's previous holiday quarter as disappointing, as evidenced by the continued slump seen in the company's stock price. But despite that perception, the company still outperformed all of the most profitable U.S. companies with net income of $13.1 billion. When Apple's stock was on its upward trajectory, market watchers had high hopes, with price targets as great as $1,111 by Topeka Capital Markets. And though executives at the company have signaled they are "very optimistic" about their product pipeline, a number of analysts have continued to cut their targets, citing increased competition from rivals like Samsung and Mac sales that slumped in the December quarter.